Ms.Alla Levitina was our guide and again her English,knowledge, and passion for her country is amazing! The weather was perfect and the scenery and history of this country is definately to be treasured. A great tour and a great way to get-to know Moscow! The guide was helpful and informative - and the afternoon was a relaxing introduction to the city. Beautiful sights along the river. Our guide was knowledgable, caring and nice, we loved her! 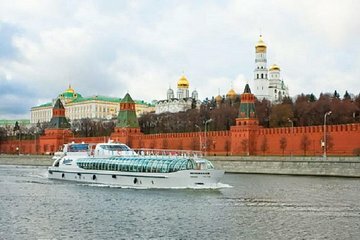 The River Cruise itself was really good, and the sceneries of Moscow from the boat were amazing, so all my stars go for the tour itself. However, the guide wasn't that good, as she was considerably less enthusiastic than those incredible, inspiring guides we had in St Petersburg. Also, the knowledge of English of this 'professional' guide could be a little bit better. I suggest therefore Viator to be more selective and careful in selecting and employing guides. After having several astonishing tours in St Petersburg last January, we had very high expectations for Moscow, but overall our experience was somewhat disappointing. In addition, the booking process of this particular tour 'River Cruise with Guide' was a pain, especially when you're travelling abroad. This matter must be significantly improved. Excellente visite avec une guide très professionnelle. Prise en charge a l' hôtel pratique.